What could be more irritating than a continuously nagging and painful blister getting into the groove and rhythm of your brisk run? Blisters are the most annoying enemy of hikers and runners. And though it is always best to prevent blisters in the first place, knowing how to treat a deep heel blister once you’re past the prevention step is crucial for your proper foot care. When you repeatedly perform certain movements like while walking and running, the friction caused between your heels and shoes or socks rubbing against the skin causes the upper layer of the skin to form a pocket full of fluid. 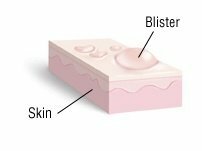 The blister is a small bloat puffed up on the upper layer of your skin. It typically starts out as a hot spot accompanied by a sensation of warmth. Reddened skin soon follows up after constant burning and stinging of the surrounding area. How to Prevent Heel Blister? When you are all laced up, always make sure to leave a small wiggle room in the heel area. About a quarter inch of lift from the heel is advisable for natural foot stride. This is the best way to prevent friction between the heel and shoe﻿﻿ which will eradicate the possibility of heat sensation and then blister. I randomly ran across these heel protectors and have found that they work exceptionally! I put these on before my socks and they limit the friction on my heel that is created by the sock and the shoe. Oddly enough some runners get heel blisters from running without socks. 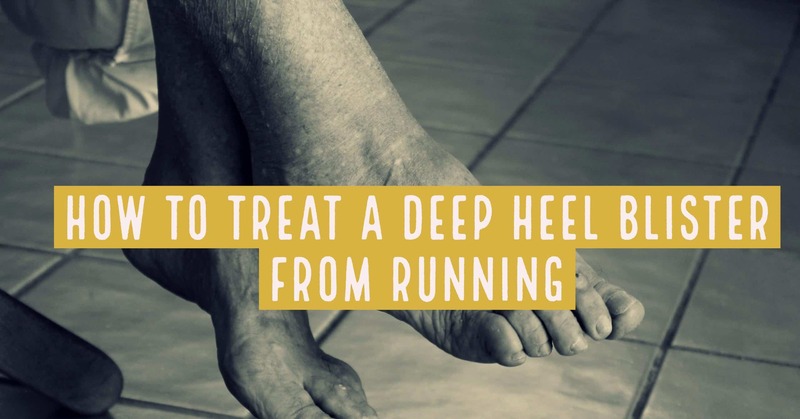 Take as much time as you want to find that sweet spot on your heel which is immensely prone to blistering. How to Treat a Deep Heel Blister? If you are one of the unfortunate sufferers of the heel blister, it is time to follow these simple steps to treat your debilitating blister. With this treatment method, you’ll be back on your feet in no time. Blisters are very common when you wear a new pair of footwear without any break-in time. Your soft and tender skin fail to stand against the stiff and unforgiving shoes. If you feel a warm sensation and reddened skin anywhere on your heels, know a blister is about to pop up. Remove your uncomfortable socks and shoes that are causing the hot spot right away. Let your feet cool down and dry out. If you are on your way back and need to walk, apply a piece of tape or moleskin to cover the burning area. This will reduce the friction and heat of that particular area where a blister might form. I'd recommend buying a small box of the moleskin tape from Dr. Scholls. It is under $10 and well worth it if you just bought a new pair of running shoes. We always recommend you to spend some time breaking in your brand new shoes. This will gradually reshape your shoes to conform to your foot shape. When you are at home, wear flip flops or slides for walking purposes and not sandals with straps. Such sandals tend to put pressure on the blister making it more painful. Walking barefoot can also irritate the area depending on the location. The Drs RX. share another good tip to help prevent them from completely forming. #2. Treating a Formed Blister With Warm Water. If you could not control blister growth after it started to form and the blister is finally on the surface, you should clean it with warm water and soap. You can also apply anti-bacterial ointment after drying out your foot. Neosporin is a favorite in our house. You can either let your blister heal on its own or pop it up. We will suggest you to let the blister heal on its own if it is not making your walking painful. If you do not pop your blister and put a band aid on, your blister will slowly heal in about a week and a half without leaving any scar behind. However, if you are in pain and want your blister to be healed in no time, drain it. Deep heel blisters tend to have a medium to large surface area above the skin and are deep into the skin. For draining your blister, sterilize a needle with either boiling water or alcohol. Now carefully insert this properly sterilized needle at the base of the blister from one of its sides and let the entire fluid drain out. The loose skin that is now covering the blister saves the area from any kind of unwanted infection. Don’t remove the skin. Now that the fluid filled inside the blister is completely drained and the site is open, there is a high probability of some infection affecting the particular area. This is why it is of utmost importance to disinfect the site of blister using povidone-iodine antiseptic. When you will apply the antiseptic, you may feel slight to sharp stinging. But this is important to keep the site from getting infected. After disinfecting the blister site, it is time to cover the area with gauze bandage or moleskin for added protection. Covered and undisturbed skin is likely to heal earlier. Thus, make sure you use a low adherent or if possible non-adherent dressing for this area which will not disturb the wound while changing it. After some time when you see the area of the blister is no longer soft and loose, remove the bandages. When you will keep the injured site in open air, it will dry soon and fresh skin will be eventually formed. Though the video below is specific to hiking it covers all of the useful steps for treating and preventing heel blisters for runners. You might want to take a few days off after the blister has been treated. If you continue running or exercising with a hot spot in its process, you will eventually make the blister worse. 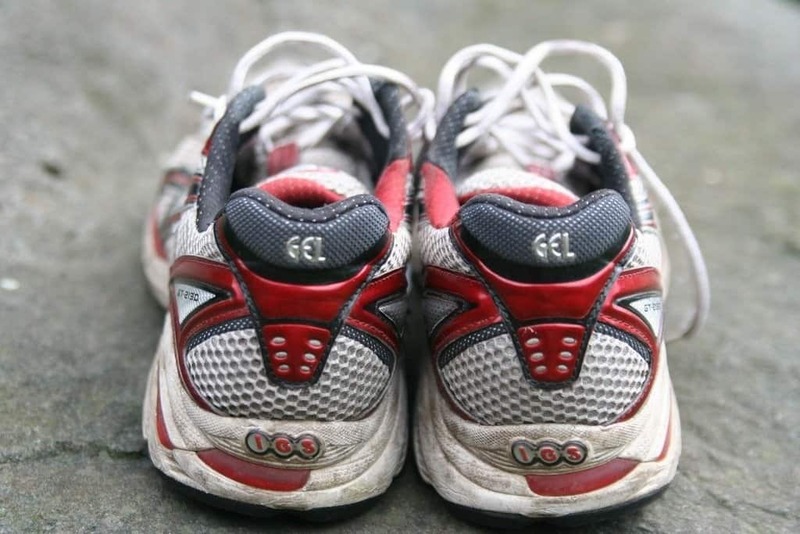 Give it proper time to heal before you get into your shoes again for walking or running. We also recommend never use duct tape on the burning area or a growing blister. This can further damage the blister and will also give you unbearable pain while removing it. While you are in the dressing process of the blister, check the blister daily and keep it clean. If you don’t use antiseptic wipes to keep the blister site clean, there are chances for an infection to occur. The common signs of infection include pus, red streaks extending from the blister, increased pain and swelling. Most importantly, treat your blisters on time to avoid interruptions from infection. If you are looking for a good pair of socks that prevent blisters, here are our favorite.